Has anyone gotten any other Calipers to fit with Jumbo Brake Rotors on 700/900 cars? I was thinking of trying to fit later dual piston Ford Explorer/Ranger front calipers. These calipers use Lucas/Girling type mounting brackets, fit 26.16 inch thick, 286 mm diameter rotors, and have dial 45.97 mm pistons. My 88 765 with ABS had the 287 mm rotors with Bendix dual piston calipers. I upgraded to the Jumbo brakes 2 to 3 years ago. The Lucas/Girling single piston calipers are now in need of rebuilding. Figured that if I were to go to my friends junkyard I could do some test fitting of brake calipers and mounting brackets. In my area parts to fit Domestic cars and trucks are less expensive and easier to come by. In my area parts to fit Domestic cars and trucks are less expensive and easier to come by. Off topic and I'm no expert on the subject, but has anyone considered (if possible/worth it) the new focus st/rs stuff? Last edited by soclosenotnear; 12-27-2018 at 10:58 PM..
After some research I've come up with Ford Taurus Girling type front caliper with single 66 mm piston and 1999-03 Ford Windstar 280 mm rotors being a good idea to check out. The Windstar uses a Girling type caliper with dual pistons varying in diameter from 42.8 to 53.848 mm. And yes, a 0.06 inch thick ring some type would be needed for the Ford rotor to fit the Volvo hub. 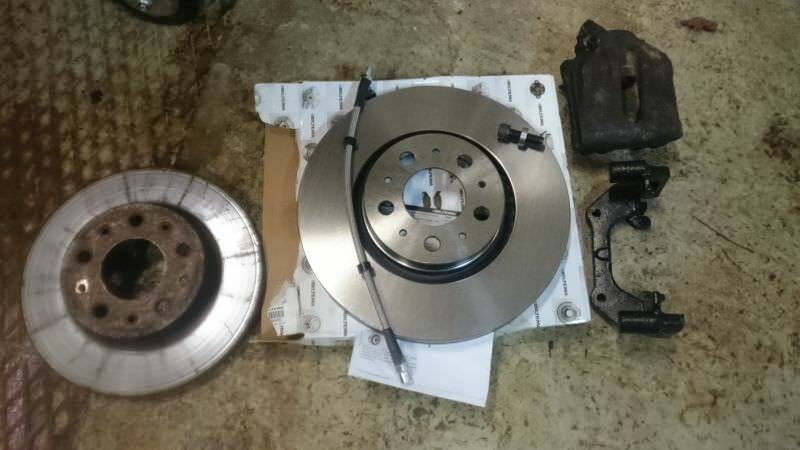 I just realized that I may be able to run the 11.0 inch 92-94 960 rotors with with either the Taurus or Winstar calipers If I can get the calipers to fit my 960 caliper mounting brackets or get the brackets from a Taurus to fit. The Taurus brake pads are very similar to pads for 92-94 960. I found a listing for a 11.57 inch (294.13 mm) rotor that uses a different offset Girling type mounting bracket fitting Ford Taurus 96-07, TBird 96-97, Continental 95-02, Mark VIII 96-98, Cougar 96-97, Sable 01-05. These cars were equipped with special sport suspension. Last edited by lummert; 12-27-2018 at 08:17 PM.. Went to friends junkyard today. Did a test fit of 94-99 Ford Taurus front calipers. http://shop.advanceautoparts.com/p/w...383/10114303-p. Rebuilt calipers to fit 94-99 Ford Taurus are half the price as those for a Volvo 960. This caliper with single 66 mm piston fits 92-94 Volvo 960 caliper mounting brackets and brake pads. Will need to adapt to a front brake hose that has M10-1.5 banjo fitting. I found some brake hoses hanging from a Saturn Vue that have banjo fitting with hole for 10 mm banjo bolt on one end and accepts M10-10 bubble flare male line fitting on the other. 92-94 960 Jumbo brake caliper has a single 57 mm piston. Ford Winstar dual piston caliper slider bolt spacing is too wide to fit Volvo 960 caliper mounting bracket. And the Windstar caliper mounting bracket to steering knuckle bolt holes are too widely spaced to fit the Volvo 700/900 strut. Now for warm enough weather to fit these calipers and brake hoses. So would you call this a "Jumbo brakes upgrade" upgrade? I'd guess a jumbo brake caliper upgrade. $44...I paid $28 each for the 850 calipers... So how is this cheaper...and uses the same hoses. Update: I needed to replace both front calipers and brake hoses, as well as the brake lines to the brake hoses. My friend owns a junk yard. I can take used parts as long as I return the leftover junk parts. To him my left over junk parts are worth just as much as the good parts sold as scrap. Ford Taurus' are still plentiful in my area. These Taurus calipers with single 66 mm piston are a good match to the 2000 Ford Ranger master cylinder with 1-1/16 inch bore that I had installed when doing the Jumbo Brake Upgrade a few years ago. The rear brake calipers have already been upgraded from 38 mm piston to 40 mm piston calipers. With the Jumbo Brake Upgrade my rear brakes seemed to be doing most of the braking. Rear pads wore at a faster rate than the front pads. Like 2 sets of rear pads to the front pads only being half worn down. So it's going to be an improvement if the front has bigger brake calipers. Today I got the left front Ford Taurus caliper and GM brake hose installed, as well as run the brake line from the ABS module to the left front brake hose. The Taurus brake caliper fit perfectly and the GM brake hose also fit perfectly after enlarging the hole in the brake hose bracket to accept the hose end fitting. The brake hose end fitting at the brake line is M10-1 ISO, same as Volvo. The brake hose end fitting at the caliper is banjo fitting with M10x1.5 banjo bolt. I used the banjo bolt that was with the caliper. The left front brake is now a 1000% better than with a seized caliper, but still lot's better than the right front brake that hasn't seized yet. So when making a panic stop the car pulls to the left. Tomorrow the weather is supposed to be better than today. I'll get the right front caliper, hose, and brake line swapped out and post an update. Last edited by lummert; 12-29-2018 at 06:44 PM..
What were the other symptoms? Rear wheel early locking on hard braking? Exactly the way I went; Skandix sells the abutment mount to properly position the 850 calipers to that big 302mm rotor. For those interested, search this sub forum and there is a complete thread about this conversion for the 7/9 vehicles. Got the passenger side done today. I had to use a belt sander to take one edge of the square banjo fitting down enough to get the brake hoses to fit pointing up (there's a locating tab on the calipers that was causing the brake hoses to point one to the front and one to the rear, not straight up). Now to get used to the brakes and make sure there's no air in the system. After several days of driving this brake experiment appears to be a success. The braking is improved, not greatly, but enough to show that the swap works. Eventually I'll get some photos to post. When I took leftover parts back to my friend's junkyard I found that the Ford Taurus that I got the calipers from was model year 2000. Not sure if that makes any difference. I went back to looking up the interchange for a 2000 Ford Taurus. Fits 2000-2007 Taurus, 2000-2004 Sable, 95-98 Windstar, 02-02 Continental. The earlier calipers should still fit, the caliper mounting bracket fits 1996-2000 Taurus and Sable. Not using the Ford Taurus mounting bracket but at least the bolt spacing is the same. Last edited by lummert; 01-07-2019 at 04:49 PM..